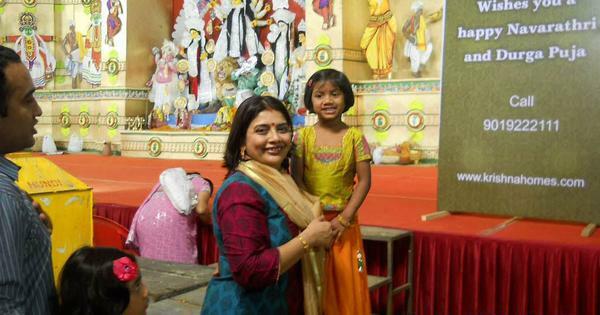 The hashtag #MukeshNitaSaveAnil started trending on Twitter on Monday. On Monday, India’s richest man Mukesh Ambani helped his younger brother Anil Ambani stay out of jail by helping him pay Ericsson the Rs 550 crores he owed the Swedish telecommunications firm. Anil Ambani’s Reliance Communications made the payment to Ericsson one day before a deadline set by the Supreme Court. In February, the Supreme Court had held Anil Ambani and two Reliance Communications directors guilty of contempt on a petition filed by Ericsson. The plea related to the failure of Reliance Communications to pay Ericsson dues outstanding to it despite a court order directing it to do so. Reliance Communications owed a total of Rs 571 crore to Ericsson, including a one-time settlement of Rs 550 crore and interest payments, according to reports. It had already deposited Rs 118 crore with the Supreme Court in February. The court had then threatened to send Anil Ambani to jail if the full payment was not made by March 19. “My sincere and heartfelt thanks to my respected elder brother, Mukesh, and Nita, for standing by me during these trying times, and demonstrating the importance of staying true to our strong family values by extending this timely support,” the statement said. The elder Ambani’s generosity was quite unexpected. 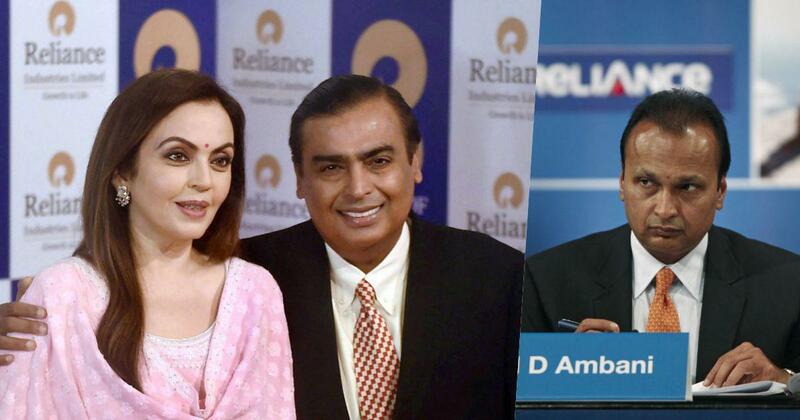 Soon after the death of their father Dhirubhai Ambani in 2002, the rivalry between the Ambani siblings had led to a public and ugly split of assets between them. Anil Ambani alluded to this in his statement, saying he and his family “are grateful” and “deeply touched with this gesture” that they “have moved beyond the past”. Ironically, Mukesh’s Ambani’s entry into India’s telecom market in 2016 was one of the factors that put his younger brother’s business under pressure. 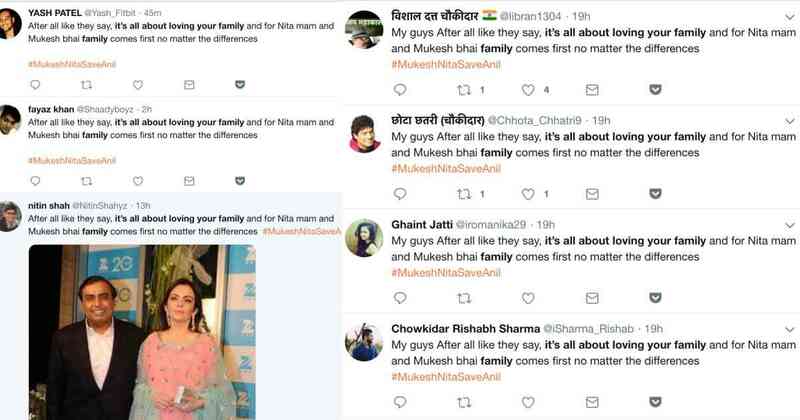 Soon after news broke on Monday that Mukesh Ambani had helped his brother pay the Ericsson dues and avoid a jail term, the hashtag #MukeshNitaSaveAnil started trending on Twitter. 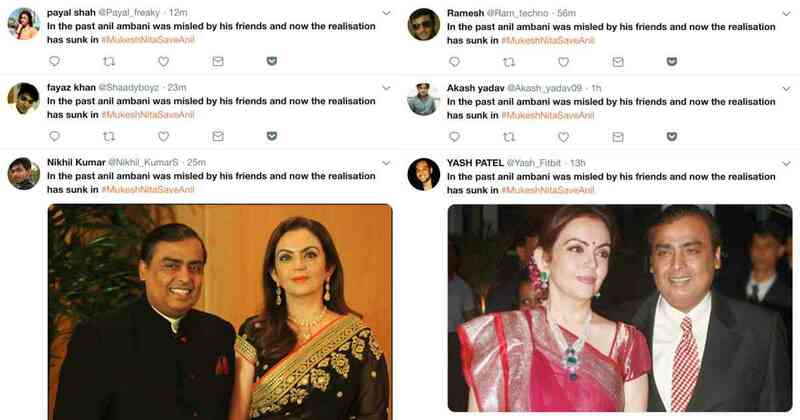 Hundreds of identical tweets praising Mukesh Ambani and Nita Ambani for bailing out Anil Ambani started flooding people’s Twitter timelines. It is not unusual for public relations agencies working for businesses, brands and public figures to employ social media influencers to help spread the word. These influencers run multiple social media handles and are provided a brief about the campaign that contains some sample tweets, hashtags they should use, a list of people they should tag and the timing of the tweets. These copy-paste Twitter handles put out hundreds of tweets every day and often make the same mistakes. For example, every user who “fell in love with Mukesh Ambani’s nature” after he helped his brother left two spaces instead of one while keying in the senior Ambani’s name. 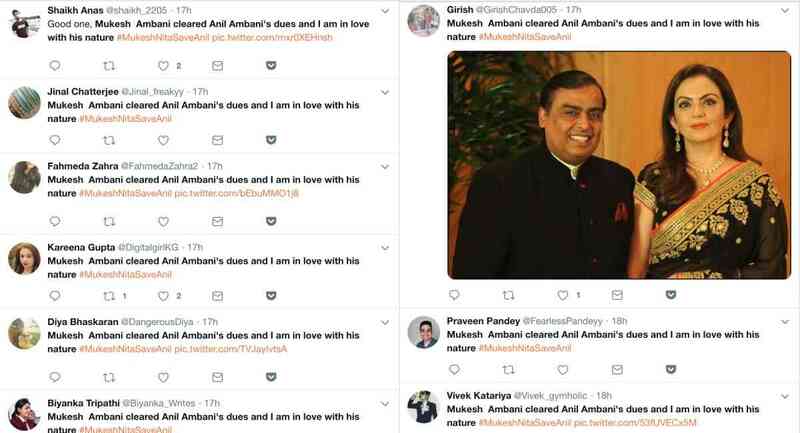 This is not the first time the Ambanis have received adulation on Twitter. In December 2017, Twitter users trended the hashtags #AnilAmbaniWalksTheTalk and #AmbaniWalksTheTalk, praising Anil Ambani after he sold the wireless assets of Reliance Communications to Mukesh Ambani’s Reliance Jio Infocomm. The deal helped Reliance Communications pare its debts by Rs 39,000 crore. This latest episode did not, of course, go unnoticed. Adoption rules are changing, but can the new system really give more children a home?